Save up to 75% on prescriptions not covered by insurance, including many pet medications. AAA Prescription Savings is FREE for AAA members, and the whole family is covered, even the furry ones. 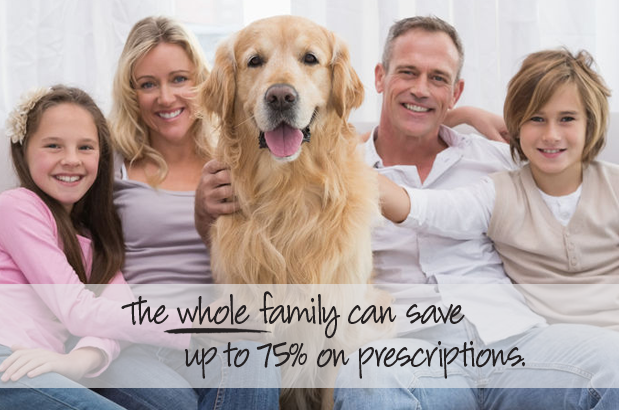 If insurance does not cover your prescription, you have high co-pays or deductibles, or no insurance at all, members can save up to 75% off prescriptions, including many pet medications. More than 67,000 pharmacies participate in AAA Prescription Savings nationwide, including CVS (and Target locations), Walgreens, Rite-Aid and more. Mail order service is also available, for convenience and even more savings. Download and print your AAA Prescription Savings card or use the digital card from the free AAA Mobile® app, available through Google Play or the App Store. Simply present your card to the pharmacist when filling a prescription and watch the savings add up. AAA Prescription Savings is not insurance. Discounts are only available from participating pharmacies. By using this card, you agree to pay the entire prescription cost less any applicable discount. AAA members save an average of 26% on prescriptions. Savings may vary by pharmacy, drug strength, dosage, and quantity. Savings are based on actual 2017 drug purchases for this program administered by CVS Caremark, located in Woonsocket, RI. The program administrator may obtain fees or rebates from manufacturers and/or pharmacies based on your prescription drug purchases. These fees or rebates may be retained by the program administrator or shared with you and/or your pharmacy. Prescription claims through this program will not be eligible for reimbursement through Medicaid, Medicare or any other government program. Heartworm or flea/tick prevention medications are not covered. AAA Prescription Savings cannot be combined with insurance or any other discounts. This contains references to brand-name prescription drugs that are trademarks or registered trademarks of pharmaceutical manufacturers that are not affiliated with CVS Caremark or AAA.